The haptophyte Emiliania huxleyi is an ecological all-rounder. Scientists now have deciphered the alga's genome and discovered the genetic principle behind the alga's enormous capability for adaptation. 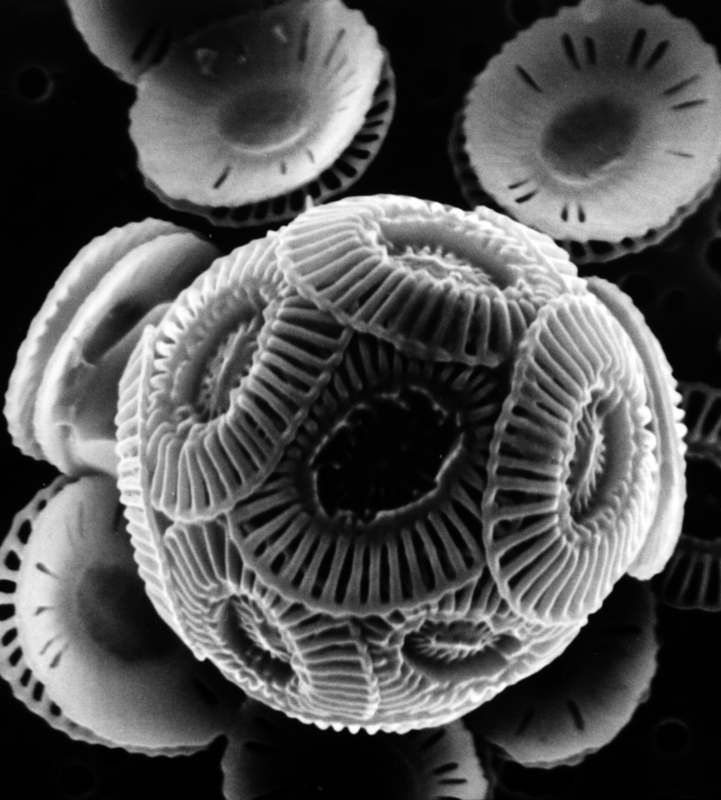 Emiliania huxleyi, a single-celled phytoplankton, measures only five to ten thousandths of a millimetre; this is eight times smaller than the diameter of a human hair. It inhabits almost all the Earth's oceans, with the exception of the very cold polar regions. When it blooms, it occurs in such abundance that the algal bloom is visible as a milky-white blur even from space. 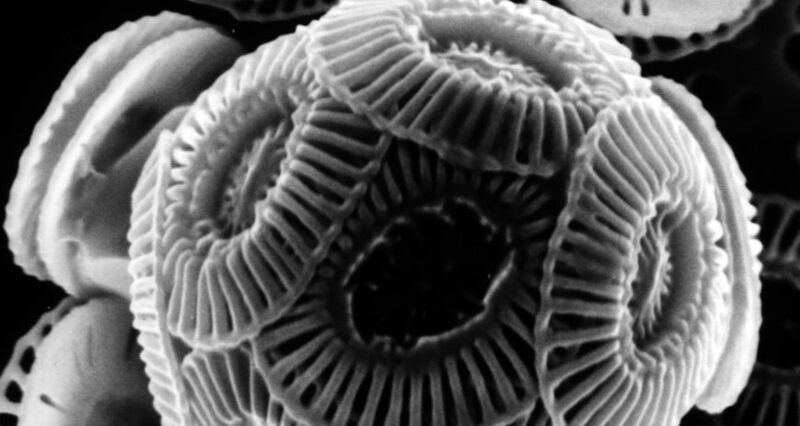 Without this microalga's calcium carbonate exoskeleton, the chalk cliffs on the German island of Rügen or the White Cliffs of Dover would not exist. These landmarks are nothing but gigantic calcium carbonate plate deposits – alga exoskeletons accumulated over millions of years. Moreover, scientists assume that the single-cell organism counteracts climate change, since it captures large amounts of CO2 from the atmosphere when forming its calcium carbonate plates. In co-operation with an international research team, scientists from the Alfred Wegener Institute, Helmholtz Centre for Polar and Marine Research (AWI) have deciphered the genome of Emiliania huxleyi and, in doing so, have found an explanation for the unicellular organism's enormous adaptability and distribution. It possesses a so-called pan-genome. This means that this species shares a given, comparatively small basic set of genes, which is augmented by different genes depending on their habitat. When comparing the genetic information of, for instance, two humans, it is 99 per cent identical. Two populations of Emiliania huxleyi from different regions of the Earth's oceans display a match of only 70 to 80 per cent. The remaining DNA is variable. So far, this genetic characteristic was known to occur only in bacteria. "If we know the genome, we can find out a lot about what the organism is capable of and how it reacts to changes, for example, in the course of climate change", says algae researcher Klaus Valentin from the AWI. Due to its genetic flexibility, the microalga can adapt to almost all marine conditions and can survive in almost all the Earth's oceans. In their study, the AWI researchers identified, amongst other things, a group of genes allowing Emiliania huxleyi to grow in conditions featuring only low levels of phosphorus, iron or nitrogen. Also, they identified a set of genes responsible for the alga remaining unharmed even in the event of high exposure to sunlight. "This considerable genetic diversity will hopefully allow the alga to cope with the current changes in the oceans, such as rising water temperatures and increasing carbon dioxide levels", says AWI biologist Uwe John. The genome data provides the AWI scientists and their international colleagues with a basis for further research, for instance, for understanding how increasing ocean acidification might influence metabolic processes within Emiliania huxleyi. There are millions upon millions of tonnes of plastic waste floating in the sea. A problem with global dimensions has been developing out of this for many years now.